This is our new baby! It was delivered to us on 13th July this year. We are very excited to be able to share with you many of the coffee shop recipes and some of the stories around coming to this island, falling in love and setting up Two Whales. It has 240 pages printed in colour, is full of stunning photographs and illustrations and includes our most sought after recipes for soups, cakes, simple suppers, patés and gluten free treats—including 83 vegan recipes. 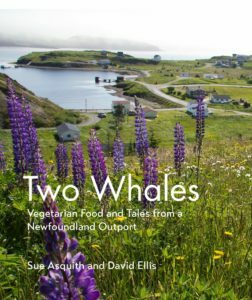 “We invite you to find inspiration within the covers of this book, which rambles gently through our stories of resettling in a Newfoundland outport, our house-building adventures and the process of setting up our business, whilst nourishing you with recipes from our wonderful Two Whales Coffee Shop menu. Our cafe menu is big on soup, so you will find lots of soup recipes but we are also known for our baking, and so you will also find a great selection of our most requested recipes. Find some simple ideas for breakfast, lunch, patés and salads. Two Whales food feeds the body and soul using local, seasonal and organic produce. Since publication we have received many, many lovely comments about our cookbook. The coffee shop is now closed but if you are in the area you are welcome to contact us by email and we can arrange collection. You can now buy our book from Food For Thought 84 Gower St, St John’s. Nancy (the owner) has always been a great support to us and we think it’s wonderful that you can now get our book from the place we turned for our ‘weird’ veggie ingredients and unusual spices when we were starting out – and still do for some things. The cookbook is priced at $32. We are also able to mail copies to you via Canada Post anywhere in the world. We will charge postage at cost — around $17 for mainland Canada and the USA; $20 for the UK (by sea). Multiple copies are much cheaper per book e.g. ten books were sent to Vancouver for around $38 and two copies to Alberta for around $24. Please go to the contact us page and send us a message with your address, telephone no. and number of copies if you would like to receive the cookbook by post. We will contact you with an estimate for the postage and ask if you would like to pay by Interact eTransfer or PayPal.